An interest in physiotherapy led Todd to take the next step in becoming a chiropractor. During his last year at the University of Auckland, he considered moving to Australia to attend chiropractic college in Melbourne. His brother, however, found out that New Zealand had its own chiropractic college. 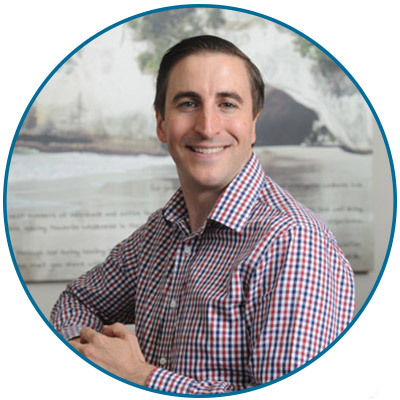 Todd completed his Bachelor of Science in Cognitive Behavioural Psychology, then moved onto New Zealand College of Chiropractic. It was on the first day of lectures that he learned a life-transforming fact. His philosophy professor asked the class, “If you drink too much alcohol and start throwing up, are you sick, or healthy?” Todd replied that of course, the body was sick. The professor corrected him, explaining that throwing up was the body trying to rid itself of poison and was, in fact, demonstrating health. From that day on, Todd learned about the body and its incredible self-healing, self-regulating abilities. Having taken antibiotics and had surgery as a child, this idea formed a new paradigm for healthcare in Todd’s mind. Todd continued his chiropractic education with postgraduate studies at Life Chiropractic College West in San Francisco, one of the most technologically advanced and prestigious chiropractic institutions in North America. He completed an associateship in Australia, then spent two years travelling as a locum chiropractor, mainly in New Zealand and Australia. This experience allowed Todd to see many different practice systems, philosophies and techniques. He put together the best of the best, opening The Chiropractice in 2005 based on all that he’d learned. Born and raised in Auckland, Todd is married with three young children, Joshua, Aria and Charlie. Between his family and his dog, Fritz, he stays busy outside of the practice. He enjoys skiing in the wintertime, waterskiing in the summer and does a fair bit of boxing training in his spare time. He’s involved with the New Zealand Chiropractic College as an Intern Mentor and is a former counsellor for the New Zealand Chiropractic Association. Let Todd use his years of experience to benefit you and your family. Contact our team today to schedule your appointment!